Across the Branch: Guess What?!?! The taco truck is here!!!! You thought it was something really exciting, didn't you? Well, this is enough to make me ecstatic! We love the taco truck. AND, it turns out that this year we have three taco trucks. I think since it's the beginning of harvest, they're still ironing out the details and deciding which one will come every day or maybe they rotate among all the farms. As long as someone with real Mexican food feeds me lunch, I'm happy! Brad and I ate the most delicious lunch today. 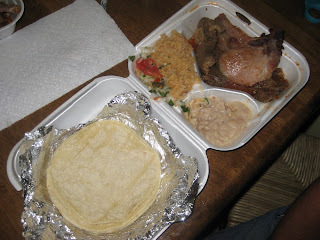 We had a pork chop and some beef with beans, rice, pico de gallo, and homemade corn tortillas. ¡Qué rico! YUM! Those Mexicans sure can cook ;) Ha! Where can I get a taco truck?